It’s the fourth year of our reading challenge, and we’ve prepared new categories to get you reading more! The Read More! 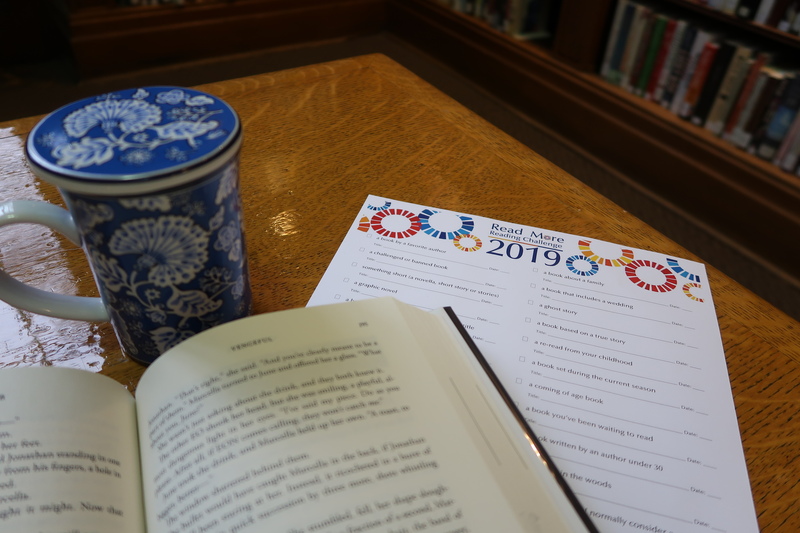 2019 Reading Challenge (or Read More! 2019) invites you to read 24 books throughout 2019. That’s two books a month. We’ve also added two bonus categories for those of you who would like to challenge yourself further. And, while we’re not telling you specific books to read, you do have to read different types of books. This year’s categories include a book with stars on the cover or in the title, a ghost story and a book you would normally consider a guilty pleasure. There are also many categories with more freedom of choice like a book you borrowed (or bought) in 2019 (yes, this include library books!) and a book you’ve been waiting to read. Sound fun? You can take a look at our full challenge here: Read More! 2019 Reading Challenge. Feel free to print out a copy of our reading challenge at home or stop by the library to pick one up. Check off the books as you go (and use sites like GoodReads to keep track of what you’ve read). But wait, there’s more! If you fill out the reading challenge and return it to the library by January 3, 2020, you’ll win a prize! This year we’re also offering a reading challenge for our younger readers. Check out the Read More! 2019 Reading Challenge for Kids! View the reading challenge and print out your copy at home. Want to participate but feeling a bit overwhelmed? Don’t worry, we’re here to help! We have suggestions for you! Or you can listen to our bi-weekly podcast, We Need to Talk About Books, where we’ll be featuring a different category each episode and talk about the great books that we’ve been reading. Plus, if you use social media, check out our Pinterest board for book suggestions and keep an eye on our other social sites throughout the year (Facebook, Instagram and Twitter) as we’ll be offering book suggestions for the challenge there as well and be sure to tag us with #readmore2019. Pin the image above to pass this challenge along to your book-loving friends. Then, share your progress with us online (Facebook, Instagram or Twitter) with the tag #readmore2019.